“For the communities in Illinois and Wisconsin that we serve and for our two organizations, this is an unprecedented opportunity to shape our future and better serve patients,” said Nick Turkal, M.D., president and chief executive officer of Aurora. “We are fortunate that our organizations are coming together from unique and complementary positions of strength, particularly at a time of evolving industry dynamics. Working together, we will deliver on the promise of value for the people who receive, provide and pay for health care.” Both the Advocate and Aurora Boards of Directors approved the plan, announcing the decision to physicians, nurses, associates and caregivers in both organizations today. 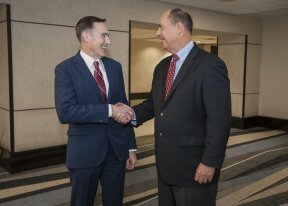 The merger will build on the 20-year relationship the two health systems have had through the joint ownership and operation of ACL Laboratories. The new organization will operate 27 hospitals, more than 500 sites of care, employ more than 3,300 physicians and nearly 70,000 associates and caregivers. With combined annual revenues of approximately $11 billion, Advocate Aurora Health offers significant resources and the financial flexibility to expand investment and scale innovation. The agreement is subject to state and federal regulatory review and approval, including the Federal Trade Commission and agencies within Illinois and Wisconsin. Closing is expected by mid-year 2018.